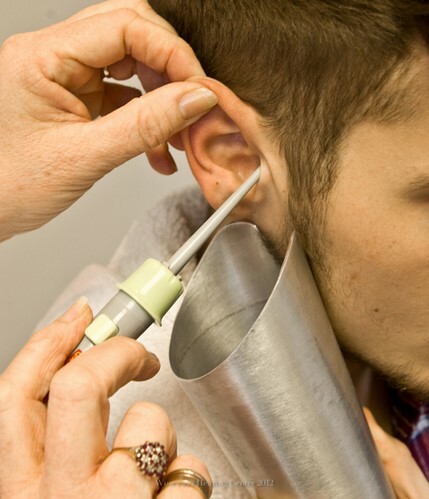 Looking For Earwax Removal Glasgow, Edinburgh or Across Scotland? If any of these symptoms sound familiar to you, then you could have excess ear wax blocking your ear canal. Under normal circumstances a little wax in the ears is totally normal, in fact it is a very good thing. We need a little of it to maintain a healthy ear. Wax is produced inside the ear canal and it lubricates the skin and helps prevent dust and air borne bacteria from entering. A normal ear canal has a self-cleaning mechanism, where the small hairs in the canal encourage the wax and shedded skin towards the canal entrance. If the ear canal is narrow or an unusual shape it is sometime impeded, resulting in a build-up of wax that may need removing by a qualified practitioner. We offer ear cleaning by two methods, micro suction ear wax removal and irrigation ear wax removal. Impacted wax can affect the results of a hearing test and it also obscures the view of the eardrum, which stops us from viewing the health and condition of it. This is an important part of an overall hearing health assessment. We noted that more and more of our customers were having difficulties obtaining earwax removal. So we decided to take action, we undertook accredited instruction courses and now we are certified to remove wax. Our earwax removal service is now an integral part of our wider hearing healthcare services. Why you should have ear wax removed professionally. It is not advisable to use cotton buds to try and clear earwax, all it does is push the wax towards the ear drum. This causes even more problems and makes it more difficult to remove. You should definitely never poke anything into your ear trying to relieve the problem yourself. The old adage is true, nothing smaller than your elbow in your ear. The lining of the ear canal is very delicate and can easily be damaged. Leave it to us to remove the wax for you. We use two methods for ear cleaning, dry removal via microsuction and low pressure irrigation, both are very safe and very effective. Although a certain amount of earwax is necessary and healthy, it can also effect the wearing of hearing instruments, so we advise regular check-ups of both your ears and your hearing aids. We have now introduced home visit earwax removal services in Glasgow, Edinburgh and across Scotland. We will come to your home and remove your ear wax. Microsuction is a relatively new method of earwax removal, however, it is considered to be safe. No liquids are introduced during the procedure which is undertaken with a microscope and a finely balanced medical suction device. The fact that we can clearly see the ear canal and what we are doing, makes it safe. With no liquids involved it is comfortable for you and it is usually undertaken in a few minutes. However, some ear canals are more suited to earwax removal via the traditional irrigation method because of their shape or size. Looking For Micro suction ear wax removal in Edinburgh, Glasgow or Across Scotland? We can also use the irrigation method for people who are more comfortable with it. It is also the most effective method of earwax removal. Some ear canals are difficult for micro suction because of shape. The shape of the ear canal does not affect irrigation. The liquid cleans out the canal entirely. We use a spray type ear wash method, which is commonly used in the medical setting. The irrigation solution is carefully warmed to body temperature as this has proved to be the safest method. We use the spray type ear washer to gently stream water into the ear. The procedure is simple, we pull the external ear up and back gently, aim the nozzle of the sprayer slightly upwards and backwards so that the water flows along the roof of the ear canal. The irrigation solution flows out of the canal along its floor taking wax and debris with it. Irrigation may need to be repeated a couple of times. If you are interested in having earwax removed by irrigation, it is important that you soften the wax first. You may may need to use an oil for 3 to 5 days before removal in order to soften the wax and ready it for removal. It is highly advisable that you get your oil from a hearing healthcare professional or pharmacy. The oil is usually dropped into the ear at night just before bed as it will expand the wax and possibly cause you some hearing difficulties. It is best to do it just before bed and let it work while you sleep. 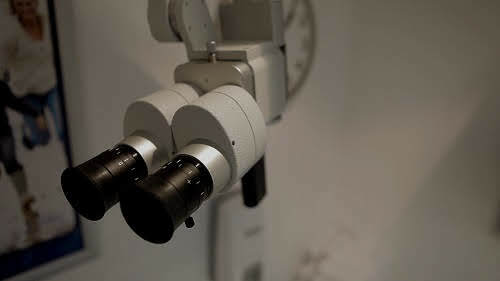 Ear wax removal has become increasingly difficult over the years to access for some reason, some surgeries provide this service and some don't and there doesn't appear to be any reason why it is different from one surgery to another. To book your appointment call us on 0800 169 68 62 or complete our contact form.